I'm posting this question under Richard & the Historians because it seems to fit better here than in Latest News. I'm asking it because Phillipa Langley's comment about her research she can't talk about triggered all kinds of ideas about archives and libraries I'd like to investigate, if I had the time and money. Where would you look for documents proving the bones in the Westminster urn can't possibly be those of the vanished princes'? Here are some of my ideas. Please understand I'm allowing myself to be totally unrealistic. I don't know enough about local archives and historical detective work to be accurate or realistic. But I think it's worth a post, anyway. 1 - Tyrell family account books, found in local library storage room. Items referring to large payment from Richard III's government show that Tyrell escorted Edward IV's sons to safety at one of the Duchess of Burgundy's remote manors. 2 - James IV's account books, found in Scotland's national archives. Items referring to expenses for "Perkin Warbeck" and his marriage offer convincing proof he was Edward IV's younger son. 3 - John II of Portugal's account books, found in Portugal's national archives. Items referring to payments from the Duchess of Burgundy for her nephew's training in a remote and safe Portuguese noble household. 4 - Charles VIII of France's account books, found in France's national archives. Items referring to payments supporting Edward IV's son against Henry Tudor. Also non-financial records expressing regret for supporting Henry Tudor's usurpation--after he invaded France in 1492. Hopefully, Phillipa's research will lead her to truths that are much stronger than my imaginings. Unfortunately, we cannot discount pure politics here. The kings of Scotland and France had a vested interest in keeping England occupied by a Pretender who could divert H7's attention away from meddling in France and Scotland. Therefore no matter what information is found in the various account books of money spent on PW and his campaign, it does not prove that either James or Louis thought him genuine, only that he had good nuisance value. Margaret of Burgundy, on the other hand had personal motives - she was the last Plantagenet with political power and wealth, so would use that to sting H7 if she could. Again, this does not imply that she believed PW was her nephew. You're right. All of them may have been willing to support an imposter for their own reasons. But that doesn't convince me that the unfortunate young man Henry VII executed was an imposter. I doubt the Tudor version of his identity because I don't believe that 15th century Europeans had the practical background to train a commoner's child to pass as a nobleman's child. I also doubt that noblemen's sons could learn to pass as commoners. Maybe European stories encouraged such claims, but European dramatic traditions didn't support real life enactments of those stories. It's my impression that Shakespeare created the earliest stage portraits of commoners and nobles disguised as each other. If I'm right about that, 15th century acting techniques gave no practical models for commoners to pass as noblemen or noblemen to pass as commoners. Many folk tales emphasized the boundaries between fiction and fact in their opening and closing lines. Even Shakespeare did so in Twelfth Night. "A great while ago the world begun/ With hay, ho, the wind and the rain:/ But that's all one, our play is done/ And we'll strive to please you every day." I wish he'd ended his Richard III that way. 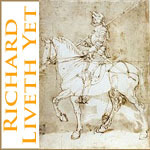 There's evidence, mentioned if I recall correctly by Annette Carson in The Maligned King, of a secret correspondence between Richard and Margaret at about the same time that Sir James Tyrell performed his secret but obviously important mission "concerning greatly our [Richard's] weal." I would look in the Burgundian records for traces of that correspondence in the hope that it related to Tyrell's escorting the boys to safety in Burgundy. Margaret supported Richard's kingship. Would she have done that if she thought he had killed Edward's sons, her nephews as well as his? And I'd also like to see any correspondence between Margaret and her mother, Cecily, after Richard's death. I agree that Margaret of York wouldn't have supported Richard if she thought he'd killed their nephews. I think Richard's 2 periods of exile in Burgundy made it likely that he'd at least think of sending the nephews to Burgundy, where his sister could provide for them. After reading Caroline Halsted's biography of Richard, I had the idea that Cecily could have sent Richard information about the situation in London after Edward IV's death. She had a residence there, and I think someone in her service would have kept her up to date, even if she wasn't in London then. I think Richard would give as much consideration to his mother's messages as anything Buckingham or Hastings might have sent him. Even if the theory that Cecily had withdrawn from political activity is mostly accurate, she may have felt she should do whatever she could to help Richard during the spring of 1483. I've found very little about Elizabeth, Dutchess of Suffolk. Her husband was politically inactive, IIRC. It would be worth knowing how often Cecily corresponded with Elizabeth and how often Margaret might have corresponded with Elizabeth from Burgundy. I'm not sure where to look for such correspondence, if it's survived.